Make learning about words fun again with a clever tale about a boy who invents a new word for the dictionary. Our resource is ready-made, saving you time when preparing a lesson plan for this novel. Set a purpose for reading by establishing which vocabulary words students are not familiar with. Show your comprehension of the novel with multiple choice questions. In a journal prompt, use your critical thinking skills to predict what career Nick will have when he grows up. Understand the difference between similes and metaphors by writing your own in a writing task. Share your favorite part of the story by drawing a cartoon strip. Aligned to your State Standards and written to Bloom's Taxonomy, additional crossword, word search, comprehension quiz and answer key are also included. 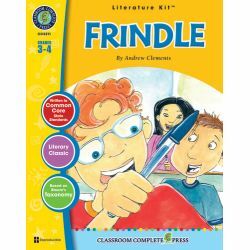 About the Novel: Frindle is the story of a clever, time-wasting schemer's innovative plan to create his own word for the dictionary. Ten-year-old Nick Allen has a reputation for developing ingenious plans that distract teachers. For the first time ever, his diversions fail to create the desired results in Mrs. Granger's fifth grade language arts class. Instead of distracting her, he ends up with an extra assignment and oral presentation on how new entries are added to the dictionary. 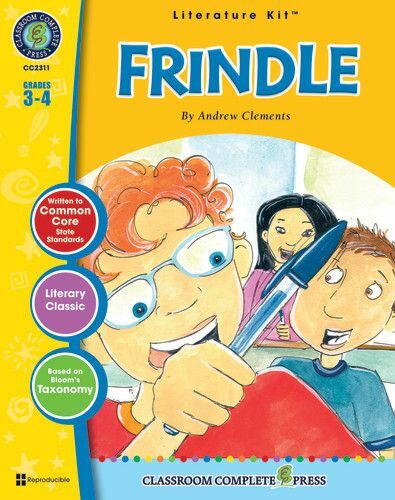 Surprisingly, the boring assignment leads to Nick's most clever idea yet when he decides to create his own new word—frindle. Nick recruits five fellow students to support his efforts in changing the name of pen to frindle. Their insistence on referring to pens as frindles causes a major commotion when Mrs. Granger's passion for vocabulary and strict emphasis on the correct use of language result in a battle of wills that threatens to disrupt the whole school. Their war of words spreads beyond the school resulting in after-school punishments, a home visit from the principal, national publicity, economic opportunities for local businessmen, and, eventually inclusion in the dictionary.